Boots and Spurs: the smooth-soled, platform boots would allow cowboys to stand in the saddle without slipping, and the silver spurs were a Spanish contribution as well as a sign of wealth and skilled mastery. 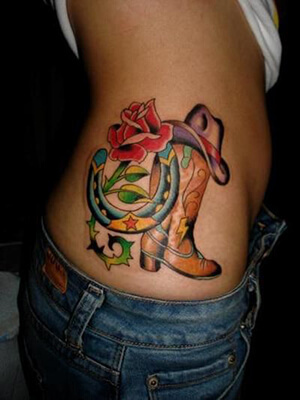 As a tattoo design, boots and spurs are a symbol of initiation, bravery, and control. Bull rider: the rodeo cowboys loved the thrill of overpowering a wild bull. 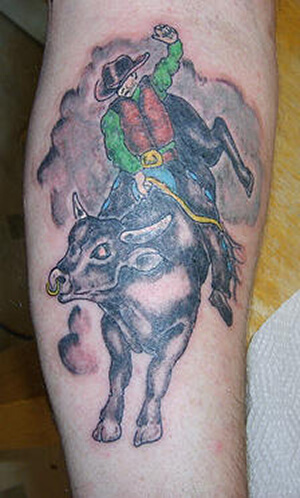 Hence, bull rider tattoo designs have come to represent invincibility, masculine energy, and overcoming challenge. 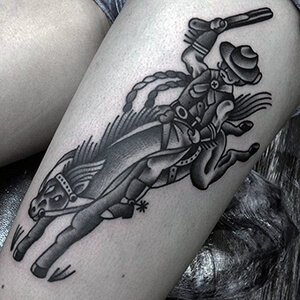 Cowboy: as a tattoo design, the cowboy represents a yearning for freedom or nostalgia for the Wild West. Feather: the Native Americans believed that the feather of a bird carried a god-like spirit with it, and so feathers were awarded to chiefs and battle champions. Since Old West American cowboys were often in combat with Native Indians, the feather filtered into the Old West lifestyle. 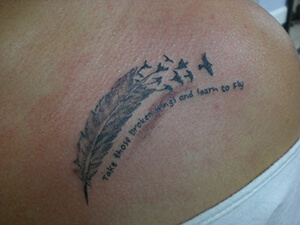 As a tattoo design, the feather represents wisdom, strength, power, and freedom. Horseshoes: kept as a talisman, horseshoes are believed to be lucky amulets. 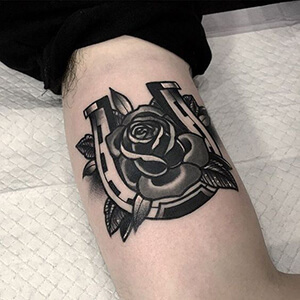 As a tattoo design, the upward facing horseshoe is a good luck symbol as well as a celebration of the Old West. Lasso: used in rodeos and to capture livestock, the lasso is a tattoo design that represents American life in the wild west. Revolver: used by ranchers, lawmen, and outlaws alike, the single-action revolver was a hallmark of life in the Old West. 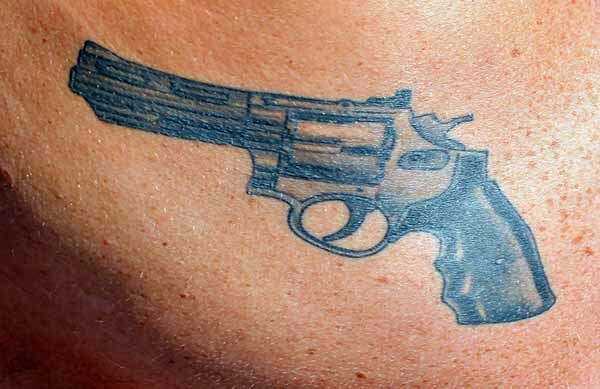 As a tattoo design, it represents true grit and rebelliousness. Sheriff: the sheriff was the authority figure in the small towns of the Old West. He was responsible for law enforcement in a lawless time. 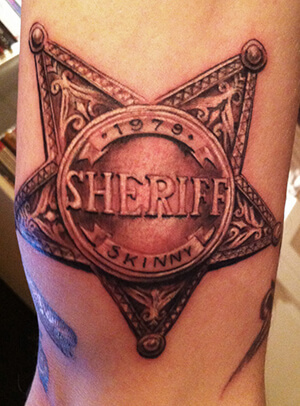 As a tattoo design, the sheriff is a symbol of authority and power. For many, the Old West recalls a time of adventure and freedom. 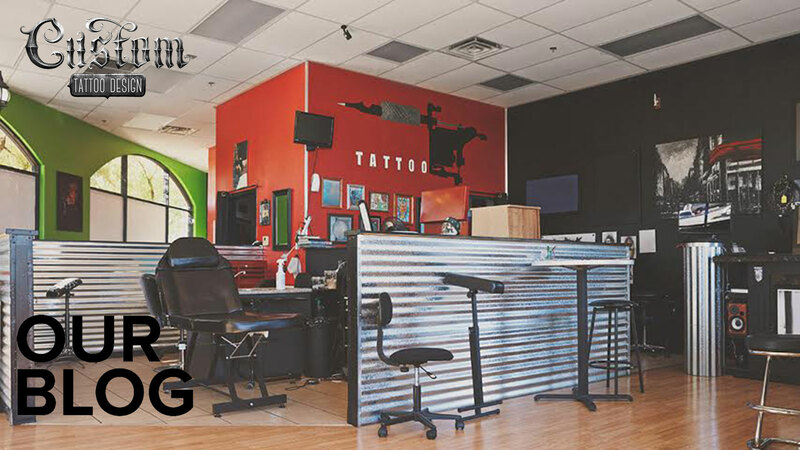 With all of the rowdy bull riding, time spent outdoors, and idyllic romances, it’s no wonder that the Wild West has found a place in the heart of tattoo enthusiasts. 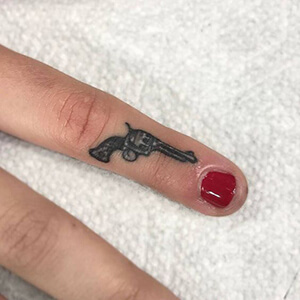 If you know of any other important Old West tattoo designs, let us know about them in the comment section below!